Unfortunately, due to construction impacts from our expansion project, the Spring Flower Show will be suspended for 2019, but is planned to return in 2020. 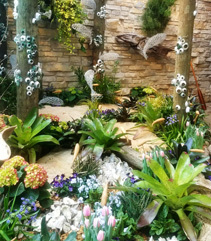 Explore a stunning scene of hand-crafted displays bursting with colorful tulips, radiant daffodils, fragrant hyacinths and other blooming spring flowers at Olbrich's Spring Flower Show. Adults and children alike will delight in the imagination and creativity used to create this first glimpse of spring! Olbrich members get a sneak peek of the Spring Flower Show and enjoy light refreshments and music in the Commons! Olbrich's Bolz Conservatory will open at 9 a.m. for an exclusive early viewing. Members receive 20% in Olbrich's Growing Gifts Shop all day from 8 a.m. - 4 p.m.
Visit our Member Benefits page to learn how to become an Olbrich Botanical Society member! Select flowers from the show will be available for purchase! Varieties may include tulips, hyacinths, daffodils, cyclamen, daisies, azaleas and more. Shop early as supplies go fast!